This 35x Maeng Da Kratom Extract stands apart from the other powdered Kratom extracts available on our site. It's the most concentrated extract we offer, and it's made exclusively in small batches in a beyond-food-grade standards manufacturing facility in the USA. 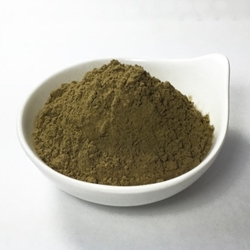 This premium quality Kratom is only available in very small quantities, and is always a Top Seller here at Shaman's Garden whenever it's in stock. Nothing in the marketplace is of higher quality, and the best part about our in-house extracts, is that there's no hype, just quality. Since we make this product week after week, and then get it tested every single time a batch is completed at Wonderland-Labs, we couldn't be more proud of the strength and purity of this exotic botanical called Maeng da 35x Powdered Extract. This 35x Maeng Da Kratom Extract stands apart from the other powdered Kratom extracts available on our site. It's the most concentrated extract we offer, and it's made exclusively in small batches in a beyond-food-grade standards manufacturing facility in the USA. This premium quality Kratom is only available in small quantities, and is always a Top Seller here at Shaman's Garden whenever it's in stock. Nothing in the marketplace is of higher quality, and the best part about our in-house extracts, is that there's no hype, just quality. Maeng Da doesn't refer to a specific strain of Kratom, it is simply a local "slang" term for the most mature Kratom leaves. As with a fine wine, the quality of Kratom increases with age, so Maeng Da, loosely translated means "Pimp's Kratom". We'll leave that to your own interpretation as to how that equates to high quality! Proud to be one of the oldest and most-respected Kratom Shops in the world, we offer synthetic-free Kratom leaf and extract incenses. Forget all the varying names used by vendors to entice you in to buy their product such as "super" or "indo" and countless others; we simply offer you the carefully-crafted product that we work with ourselves. And, we've fine-tuned our extraction process over the past few years out of our passion for Kratom, reducing the less desirable properties that sometimes accompany with this research component. Customers sometimes wonder why we offer a Maeng Da "35x" Kratom Extract, as well as a "10x", a "15x" and a "20x" Kratom product. Different people prefer different products, and this is one way to continue our tradition of offering as varied a range of Kratom products as possible.